Ford has confirmed that it will put 16 electrified vehicles on sale within the next three years - with eight of them due in showrooms by the end of 2019. As well as the expected civilian models, such as the Puma and the Kuga crossovers, which have both already had hybrid derivatives confirmed, Ford will put an emphasis on its commercial vehicles (CVs) too. So the Tourneo Custom Plug-in Hybrid eight-seat MPV made its global debut, while Ford also confirmed that a Transit Custom PHEV would be offered. Both will be capable of up to 85.6mpg (3.3 litres/100km) economy with CO2 emissions from just 75g/km. Beyond these two, a fully electric Transit will join Ford's CV line-up by 2021, aimed at 'last-mile' deliveries in urban areas, while a 48-volt mild-hybrid system for the Transit and Tourneo Custom EcoBlue Hybrid turbodiesel models will see up to 42.1mpg (6.7 litres/100km) and 40.3mpg (7.0 litres/100km) possible, with CO2 emissions of 139- and 137g/km, respectively. All very noble, but it's the unusual drivetrain arrangement of the Transit and Tourneo PHEVs that catches the eye most. They use an electric motor, powered by a 13.6kWh lithium-ion battery, to drive the front wheels. Hooked up to this electrical gear is Ford's 1.0-litre EcoBoost three-cylinder petrol engine... but this doesn't ever drive the wheels of the CV hybrids, instead acting as a range extender to recharge the battery. In this way, the Transit/Tourneo PHEVs can go up to 50km on electric power alone, or up to 500km with the range-extending EcoBoost in play. 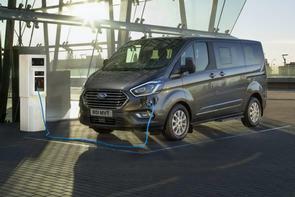 Brilliantly, Ford says that all of the payload capabilities and load spaces of the two vans are preserved, despite the addition of hybrid running gear. Hans Schep, general manager for Ford of Europe's CV arm, said: "Uniquely innovative and flexible, the new Tourneo Custom Plug-In Hybrid can adapt to an unparalleled variety of use cases, giving owners and operators the advantage of being able to drive in ultra-low-emissions zones and still cover the same ground between battery charges as a traditionally-powered people-mover. Whether delivering executive shuttle services or ferrying large families, the Tourneo Custom Plug-In Hybrid will offer comfort and refinement while also contributing to improved local air quality in busy urban environments." Using a charging port located in the front bumper, the Custom PHEVs can be fully charged on a 240-volt, 10-amp power supply in less than six hours, or a commercial 240-volt, 16- or 32-amp supply to be re-juiced in just three hours.